Day 27, book 27. It reminds us why creating the conditions for lyricism is such an important duty for marketers. And so ends the summer hiatus. 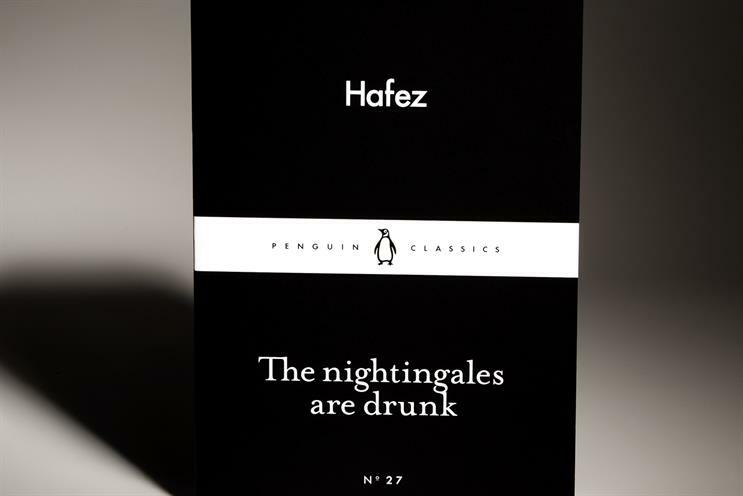 Today’s book is a selection of 14th century Persian poetry by Hafez, entitled The Nightingales are drunk. Hafez is a household name in Iran. Skipping all that there is to know about him, and about the cultural importance of Shiraz where he was born (we think) in 1317, is a bit like writing 400 glib words about The Tempest without reference to Elizabethan England, but I must plough on because there is one very simple point to make about these lovesick couplets. They leap straight from the page and straight from the heart like the lyrics of a song. They read like the fragile scribblings of the stadium balladist, despite being written nearly 700 years ago. The nightingales are drunk is a phrase that combines the themes of wine and love. It could be a Sinatra memoir title. It could be an episode from my graduate traineeship in Berkeley Square. But most of all it sounds like the name of an album, and the poetry inside the cover has the rhyming spirituality of Gary Barlow; the desert heartbreak of Brandon Flowers; and the worldly mischief of Lily Allen. It is no coincidence that the poetry of Hafez has enjoyed widespread musical interpretation. And it makes sense that Hafez’ preferred poetic form – the ghazal – is highly suggestive of a pop song, constructed as it is of rhyming couplets and refrains. So read this as music; think of it as a pure form of lyrical expression that closely resembles music in its intent and its effect; let it flow from the page like a love letter, and ask yourself this. Does anything that comes from the voice of your brand flow from the page like a love letter? Is there a space, however small, within the protocols by which you define your brand - its strategy, its relationship with the public, its role in our lives, its point of difference, its ethos - where you allow such lyricism to flow? Ask yourself this question not because brands need the soul of Hafez to succeed. They don’t. Ask yourself this question because the conditions necessary for a lyrical outpouring are conditions that every marketer should aspire to. Lyricism is only possible when there is alignment; it is only possible when there is clarity of purpose; and it is only possible when there is not just transparency but a level of comfort with transparency. And even if these conditions are met and lyricism is possible, it only really occurs when a business knows what it wants and cares deeply about having it. Lyricism and longing, in the work of Hafez as in life generally, are closely connected. If your brand never sings, the chances of anybody outside your organization being moved to buy it are slim. Music takes the mathematics of harmonic intervals and transforms them into a language that is powerful beyond reason. Marketing seeks to do something comparable, as it moves from rational strategy to creative expression. Marketers can’t all be musicians. But we can all create the conditions for lyricism. And a good place to start is to read some.